Shaik Imaduddin has imagined the next big phablet coming out of Nokia. The device is dubbed Nokia Lumia 1530 and it’s shown in the image below. This is the successor to the Nokia Lumia 1520 and it’s a 6 inch phablet with a 1080p IPS display. It has a Snapdragon 805 processor, 3 GB of RAM, 32 GB of storage and a 20 megapixel camera with OIS. There’s also IP67 water and dust resistance and the general format of this model is pretty much like the one of the predecessor only with a smaller bezel. I also notice there’s a different spacing of the Windows Phone tiles compared to what we’re used to. I’m guessing that this handset runs Windows Phone 8.1, which means it has Cortana and a decent notifications center. I’ve also spotted a new tile size, a vertical elongated one, that’s shown in the form of a To Do List. 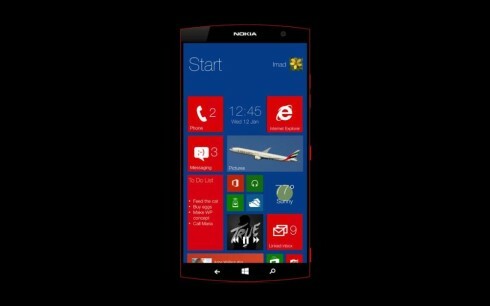 Finally, this model is rounded at the top and bottom, something we don’t usually associate with a Nokia Lumia.